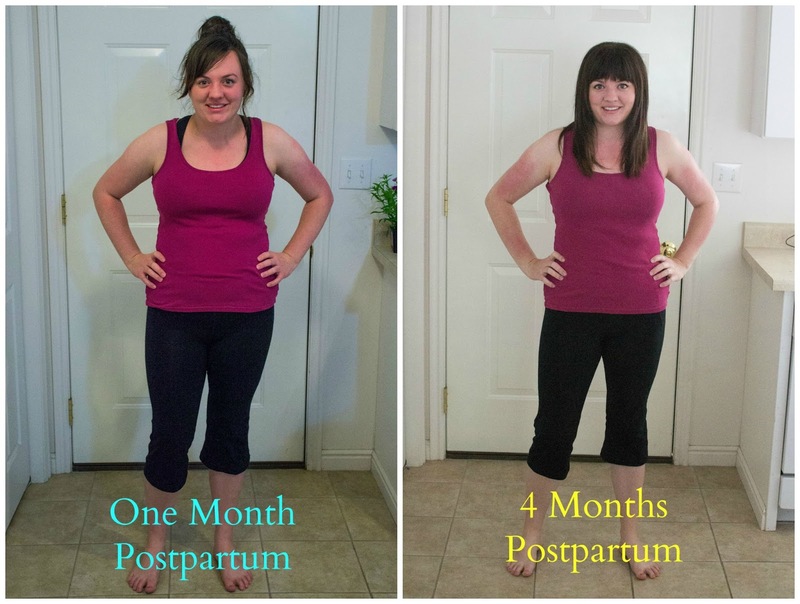 Wow–4 months postpartum already? 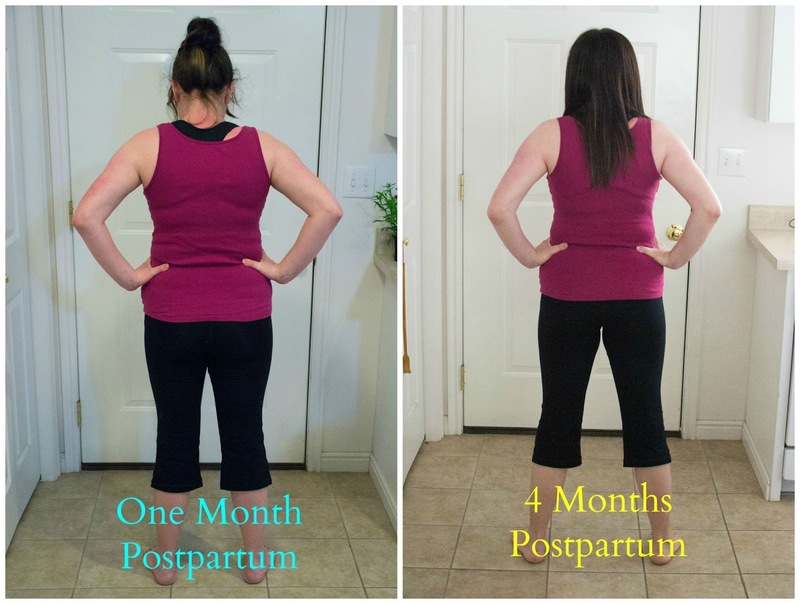 A part of me balks at the idea that I already have a 4-month-old baby, but another part of me rejoices at the fact that slowly but surely, my body is looking recognizable again. Even though I only lost 3 pounds this month, I’m feeling pretty darn proud of that number because the corticosteroids I’m on for my AI disease usually make people gain weight, and I’ve really had to be diligent about my eating habits since starting them so that the number on the scale goes down instead of the other way. Speaking of my lovely little disease, I went to a specialist about it for the first time last week (I’ll do more of a full post on that later), and it turns out I’m pretty much forbidden to count calories, do vigorous exercise, or do much weight lifting at all until we get this whole thing figured out, so honestly, I feel like it’s a bit of a miracle that I’ve lost any weight at all. 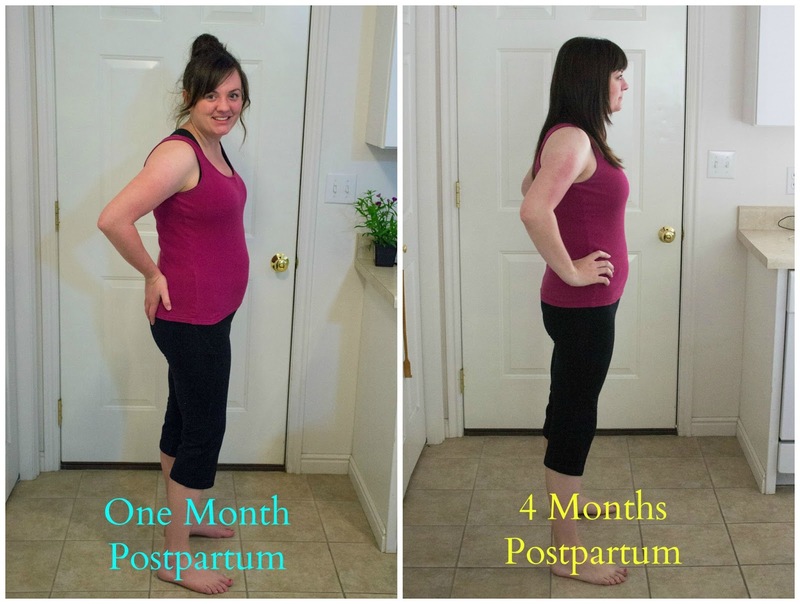 For the first two or three weeks of the last month, I didn’t see any difference on the scale or in my measurements–I knew things would be harder because of the steroids, but it quickly became clear that I was really going to have to be as mindful as possible with my diet if I wanted to lose anything while on this medication. So, because I’m not supposed to restrict calories, I focused on getting my calories from good sources, cut down on my carb intake (I haven’t bought bread in about two months), and drastically cut down on meat (especially red meat). I even ate fish (!) one night. I also watched my sugar addiction much more closely, trying to choose fruit over treats whenever possible and if I did just need some chocolate, I would make some homemade cookies and limit myself to just one or two (usually). As far as exercise has gone, I’m pretty limited still because of my muscles still being in recovery and with the doctor’s new orders not to do anything too vigorous, which he defined as running any more than about a mile and weight lifting of almost any kind (unless it was with one- or maybe three-pound weights, and just a few reps). I have also been banned from doing push-ups. So, my exercise has consisted of the once-a-week hip-hop class at the gym, maybe a short run or a walk or two, and one or two strength workouts that focus mostly on abs and crunches (which I’ve been cleared to do). I can’t wait for the day when this disease (hopefully) goes into remission and I can start thinking about training for half-marathons again and lifting with my 10-lb. weights (the only weights I have), but you do what you gotta do. Weight Right Before Delivery: 191 lbs. I’m debating on what I should do going forward—I don’t know how the weight loss will go since I’m pretty limited on what I can do, so I’m thinking I might just do another update at 6 months and maybe one more at 9 months. On the other hand, knowing that I’ll do these posts has kept me accountable and has helped me eat better and exercise more on many an occasion, so for the accountability alone, it might be worth it to continue doing it monthly, even if the results aren’t that dramatic. I can’t believe I’m only 9 pounds away from the weight I was at right before getting pregnant. Pretty proud of myself, actually. And, if you care to weigh in (pun intended), should I continue doing the monthly progress reports, even if there’s not much progress? Or should I just plan on doing another post at 6 months and then another one at 9?